Yet another amazing Cassini image was released yesterday. Taken back in February this image shows Enceladus passing in front of the giant moon Titan. What is clear from the image is the difference in colour between the two objects. 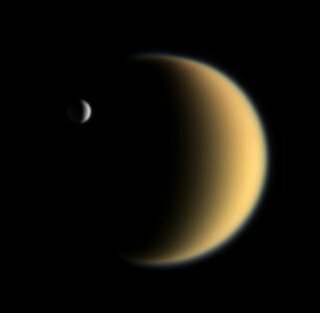 Titan has a brown atmosphere and Enceladus is almost white, its surface reflecting 99% of the light falling on it. The difference in size is also apparent, especially given that Enceladus was 1.1 million km closer to Cassini than Titan was when the image was taken. These moon transit images are becoming pretty routine from Cassini now, but to my mind this is the best yet. Perhaps next time they'll get Saturn's rings in there as well ?